Cover of book 2. Copyright: Glénat (custom logo and font). The artwork is Free/Libre/CC-By and you can find it on the sources. 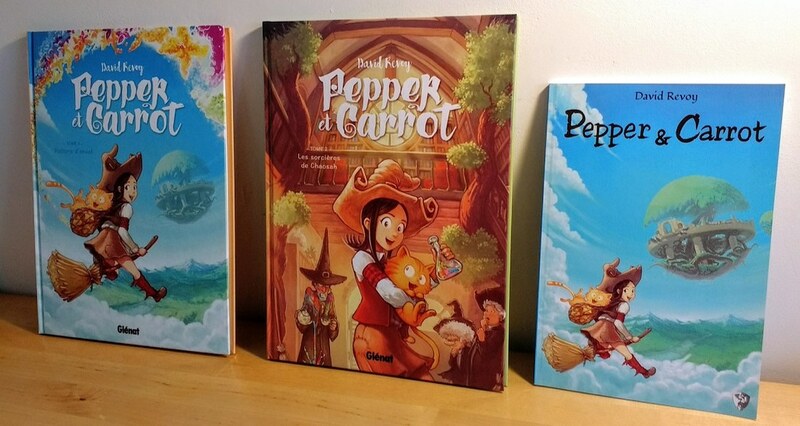 Today April 26 2017 is the release date of the second Pepper&Carrot book printed and published by Glénat (in French). The first book, published at the end of August 2016 was a success and my contact at Glénat told me they re-printed it four times! Amazing... A big thank you if you own a copy of book one. You'll find in this second book 66 pages of comics from episode 12 (the black-hole of Potions) to episode 21 (the first part of the Magic Contest). The book starts with a page containing a complete list of attributions and ends with two pages listing the names of the patrons; a good formula. I remind you I'm not earning any percentage of the sales of this book. I'm earning money only via the patronage of Pepper&Carrot. Thanks to this model, the comic keeps a low price of around 10€ in bookstore but it's still hard to communicate to the book's audience to do this optional extra step (I'm far from having 10 000 patrons, but I know 10 000 copy were printed and sold :-P ). To offset this a bit and also to help me boost the production of book three, Glénat decided to raise their patronage from 350$ to 950$. They also directly commissioned me for the creation of the cover of book two and accepted to release the illustration as CC-By. 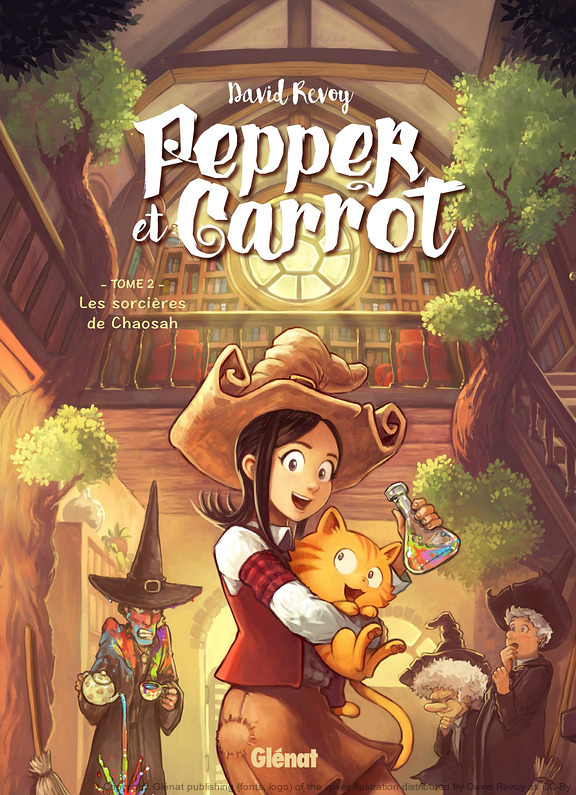 So, Glénat and Pepper&Carrot are on the way to building a nice relationship and that's really cool. Mixing Free/Libre and open culture with industrial interest is still experimental -a first case in the small (web)comic world- and it's nice to see it working so far at the scale of a country and its bookstores. By the way, if you want to purchase the second book, please consider buying it in your local small comic bookstore. It's important to support the small comic bookstore owner to survive. On my side -and to be consistent with my philosophy- I refused more than 10 prestigious invitations to sign autographs at big comic events and commercial festivals. Instead, I'm prioritizing autographs in local, small bookstores and Free/Libre events. That's why I'll be signing autographs on Sunday May 21st in Toulouse at the bookstore "Les petits Ruisseaux" between 10h and 13h. More info (in French) on this post from SqueeekGPS. That's all! I hope you'll like this second book and that the relationship with Glénat will keep going the same way to produce a fantastic third book! The latest episode 21 is also the last episode of book two. An official English version with the Krita Foundation is still work-in-progress here. with a special permission to republish here, 26 april 2017 . Reading your work online for a few months, I bought the book and lent it to friends. They all loved it. But even after explaining your philosophy, none considered giving. Two major reason I see : we're not used to give (at least I wasn't before embrassing the libre philosophy and discovering street festivals) and also subscribing on a website and pay on internet are really huge things to accomplish for a lot of people ( even for my coworkers who are PhD ! ). Great !!! Impatient to have in my hand this second book version of your wonderful work. What's the status of the English version Krita Foundation book? I'll finish the digital files Scribus project in June 2017. I think it's something for September 2017. What a wonderful set of comics! As I would like to use them to help my daugthers to learn English beside French, are you aware of any English or Italian version? No English or Italian publisher so far ; but I have a project with the Krita Foundation to publish a printed version in English. I'll finish the digital files in June. It's pretty amazing that they raised their support to account for the great success of their release and that they're playing along and putting a free license on the commissioned artwork. It feels so weird to see a company going beyond their obligations and sharing more profit than they need to. I've been debating buying the comic for my local board game café's book collection and this attitude is definitely helping the decision. Thank you for the feedback Bruno! Yes, I'm happy so far of this collaboration and win/win situation. I really love everything about your work & I would really want to know if I can buy a hard copy of the books online. I live all the way to another country. Hi! Thanks! 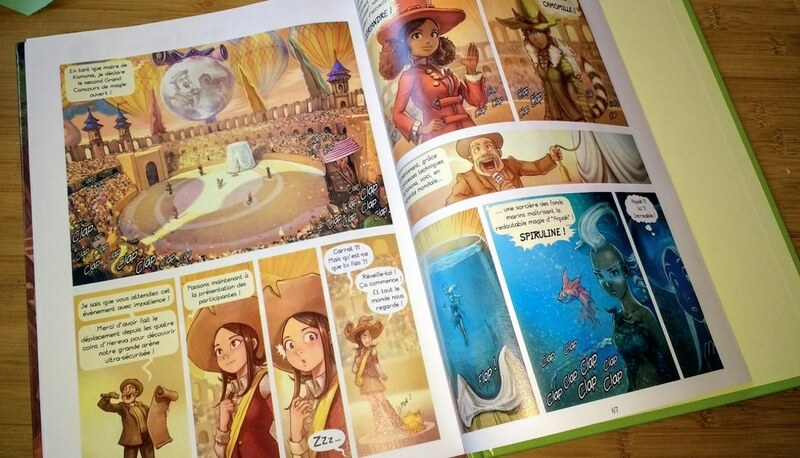 This book of Glénat is in French ; right now no english publisher tried to print Pepper&Carrot. You can buy the french version on Amazon ; I think they have international shipping.